Back-to-School Shopping This Weekend? Here Are 4 Credit Card Tips You Can’t Afford to Miss! Back-to-school shopping season is upon us! If you’re a parent trying to manage your finances during this hectic time of year, you’re probably looking for every opportunity to save a few bucks. But have you considered the ways your plastic could help you make the most of your stock-up-on-back-to-school items? Take a look at the details below for four credit card tips you can’t afford to miss! 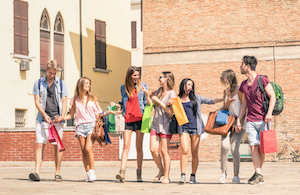 The first and most important thing you can do to maximize back-to-school shopping season is use a high-rewards credit card to do your shopping. According to a 2013 survey by the National Retail Federation, families with school-aged children expected to spend an average of $634.78 on back-to-school shopping that year. Using a rewards credit card with a stellar rewards rate (think 2% or higher) will help you get something big back for all that swiping. There’s nothing worse than making a purchase, only to find it at a better price elsewhere. But luckily, some credit card networks and issuers offer a benefit known as price protection. If your card provides this perk and something that you bought with it drops in price, you’ll have the opportunity to be refunded for the difference between what you paid and the new, lower price. This feature could put a lot of cash back in your pocket this back-to-school season! If you’re purchasing back-to-school items that come with a manufacturer’s warranty, be sure to use plastic when it comes time to pay. Most major credit card networks (Visa, MasterCard and American Express) can extend that warranty by up to one year, which provides added peace of mind when you’re buying expensive stuff. Every network has different rules, requirements and exclusions when it comes to extended warranty policies, so be sure to read up on yours. At the very least, you’ll need to keep the item’s receipt and a copy of the manufacturer’s warranty – in other words, you’ll need to keep your paperwork in order to reap this benefit! Return protection is another lesser-used credit card extra that could come in handy during back-to-school shopping season. If your child’s tastes suddenly change and a store won’t allow you to return an item, you could get a refund through your Visa, Mastercard or American Express network. Again, there’s red tape involved, and there are some significant exclusions to these policies (for instance, all exclude software). But if you know your network’s protocols and hold onto your receipts and credit card statements, you could put this perk to good use!